OFFF News for 2018 - let's do it again! The OFFF show will again be the host for the ILR Western Championship thanks to a volunteer effort led by Debby Gremmels. We will have a double performance show on Saturday the 22nd of September, and double halter on Sunday the 23rd. Fleeces are due on Friday the 21st and fleece-on classes will be judged on Saturday. Please make plans to join us in Canby. More details and the show packet will be posted on the OFFF page (see menu on the left) soon. Thank you for your past support of the OFFF show! OFFF News! 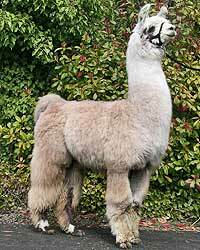 The 2016 OFFF Llama Show will start on Saturday (9/24) with _double_ performance classes, fleece-on classes and shorn fleece judging. The double halter show will be on Sunday (9/25). We would love to see a great turnout of youth for this show! We had good representation from Washington last year, so where are the Oregon youth? Spread the word among your 4-H clubs about how much fun you had, start practicing your obstacles, do "stand still" lessons for showmanship, and bring your llama to Canby at the end of September. Forms are ready for download, so go to the OFFF page (use the link to the left labeled "OFFF ILR Show") for the latest information and registration details for the 2016 Show. 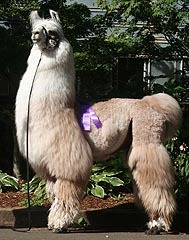 I look forward to seeing you in Canby September 24th and 25th for the OFFF Llama Show and Thank You for your support! WOW! - Congratulations to Ken and Celia Austin! 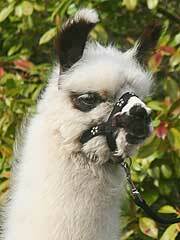 They had the high selling llama at the Spring 2010 Celebration Sale in Oklahoma City. Chilean Rosalind RDRL was the high selling female and the high selling animal overall - by the way, her sire is our Fino Chilean Rosario, the two-time National Heavy Wool Male. Congratulations - we are tickled by your success and pleased that the Rosario X Okey Dokey breeding paid off for you! HOLY SMOKES! Fino Chilean Rosario does it again at the 2008 Grand National! 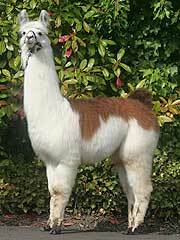 What a llama! I'm so glad that he's well behaved - it has been my job at the show to keep him exercised (when he is not exercised and gets bored he takes apart the stall) and he was fun to take on laps of the facility. Between trips for exercise and trips to the pile, some people must have wondered if I did anything but walk and run the llama! He was a gentleman on our walks but in the ring he really shows some swagger! Congratulations to all the male heavy wool entries - we were really concerned as we watched the classes assemble - what an outstanding group of male llamas! 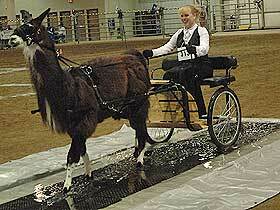 Heather is the 2008 recipient of the "Follow Me" youth award from the Llama Association of North America. Congratulations Heather - we know you are special, but it is very cool to receive this recognition from LANA. We believe the name of this award is especially fitting given the work you do with the Lucky Longneck 4-H club and the example you provide for all of us with your behavior and work ethic both in and out of the show ring. We love you and you are a great role model - Congratulations! ROSARIO - 2007 National Grand Champion!!! Fino Chilean Rosario is the 2007 National Grand Champion Heavy Wool Male! In contrast to his "performance" at the 2006 Grand National (when he would *not* stand still), this time he strolled into the ring like a champion; walking out when asked and posing at every opportunity. With his size, presence, fiber quality and a great disposition, we can't think of a thing we would change about him. Congratulations to all the other competitors in the adult age group - we were not at all sure that we could come out as #1 in that outstanding group of animals, and big congratulations to everyone who had an animal in the Heavy Wool Grand Champion class - what an awesome group of animals and we are honored to be selected from that outstanding set of heavy wool boys! Thanks to everyone who talked to us as we left the ring - it was such a blur and we don't even have pictures because Hal, Heather and Chris were busy getting the Get and Produce animals ready for the next classes! Willamette Valley Llama Foundation banquet and auction. Rosario will return to the (WVLF) banquet in Wilsonville, March 8th. 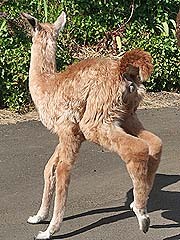 We are proud to participate in this effort and to donate a Rosario breeding to benefit camelid research. Come see "Ro" in person and you can bid to win a breeding to one of your females. If you can't be at the banquet, phone bids will be accepted - more information is available at this link. Oregon Flock & Fiber Festival 2007 is "in the books"
The 2007 Oregon Flock & Fiber Festival in Canby has come and gone! There is a brief summary and a long list of "Thank Yous" from Hal on the OFFF page (click on the OFFF link to the left). It was great to see lots of our llama friends in Canby and meet some new llama folks! I had a good time and I hope all the competitors did too! Rosario's third baby is on the ground thanks to Dr. Kutzler (details below)! As you can tell from these "less than day old" pics, we have a beautiful fawn/peach colored girl out of Beautiful Dreamer. This makes it three in a row for the fawn coloring - first, it was Duncan's "Romeo," then Tallmon's "Chase," and now this one (who needs a name but it will be something involving "peach"!). Her head and tail are a little darker and her nose and ears have some gray coloring, but the body is the same color as her neck. We have been very fortunate to have many reasonably "routine" births, but this was our second really tough dystocia. Dreamer was in labor for most of the afternoon and early evening and at about 6:30pm the cervix was dilating and we had one foot and then the second - but no nose. We gave Dreamer some time to "work on it," and Julie would periodically check if the head had come up (it was down to the left side of the baby's front legs), but it wasn't, and despite her efforts, Julie could not get it. We put in a call to Dr. Michelle Kutzler who raced over, within 1 minute of getting out of the truck had her coveralls on and had received a briefing on the situation, less than two minutes later had the head up and out!, and two minutes after that was handing Hal the baby! You have to appreciate having the "right person for the job" available when you need them! Big "Props" to Dr. Michelle; you're our Hero! The baby is doing fine (kicking up her heels in the picture to the right!) but Dreamer had a tough-go with the placenta and is feeling the effects of labor and a tough delivery. Thank You Tallmons! Some time ago, Sherri told Julie that she wanted to buy one of the Gold Glitter girls; Julie finally let one go earlier this year. The Tallmons purchased "Too" who was a Grand Champion at the 2006 Oregon State Fair and earned a Top Five award at last year's Western Regional show. Thank You Sherri and Will - we appreciate your confidence in our animals and we wish you great success in the show ring with Too and her future babies! 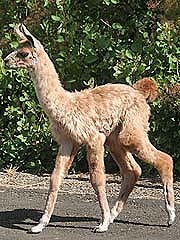 A couple of our Bolivian Asombroso kids are growing up and you will see them on the show circuit in the northwest this season. "Lookin Real Sharpp" is pictured on the left and his mom is Baby Magic. As you can see, he is very wooly and he is also very responsive. Chris has been training him on the obstacles and they have been doing well together. "Silver Shimmer," pictured on the right, is another Gold Glitter daughter. Like her older sisters (Gold Sparkle -2005 National Grand Champion Heavy Wool Female, Its Destini and I Sparkle Too), Shimmer is friendly, easy to work with and wants to please. The 2006 Grand National Llama Show in Lincoln, Nebraska went well (and getting there and back was not *too* big a deal this year - just one 30 minute white-out!). Highlights included Bright New Dawn being named the Grand Champion Light Wool female - not bad for an 11 year old! Chris and Heather received Top Ten ribbons in all but one performance class. A couple years ago, Heather decided that she and Salsalito (A.K.A. Lee) needed to drive - driving is a nice goal, but Heather did not want to "just" drive, she wanted to drive at the Grand National! With her brother's help they did all the ground training and Lee went into the cart on July 1, 2006. Lee's ALSA debut was at the Flock and Fiber Festival - it was a bit painful to watch, but it qualified them for the Regional show. At the Western Regional, he was somewhat better - there were still rough spots, but it was enough to qualified for the Grand National. With Niki Kuklenski's coaching and many warm-up laps around the Lancaster Event Center, Heather and Lee finished below Niki and Isle Eagle as the Reserve Champion Drivers! Congratulations Niki and Eagle for being National Champion Drivers and thanks for helping Heather with her goal! MORE Congratulations to the Benton County Llama 4-H group, The Lucky Longneck Llama Club, on their successful show at the Benton County Fair on August 2nd. Thanks go out to our judge, Niki Kuklenski for driving down from Washington and creating a relaxed and fun atmosphere in the show ring. As a group, the club finished with more blue ribbons than red ribbons and there were no white ribbons given out - what a great effort!! In addition, Christopher Koenig, Heather Koenig, and Deanna Duncan competed in the large animal Master Showmanship competition and ALL were named Champion: Christopher in the junior age division, Heather for the intermediates and Deanna for the seniors. Very Impressive! More information about The Lucky Longneck Llama Club is available by clicking the "Benton Co. 4-H" link in the menu to the left. Our congratulations to the Benton County Llama 4-H group, The Lucky Longneck Llama Club, on their success with their Multiple Sclerosis "Walk for a Cure" fundraising efforts. The club's goal was $6,300 which is $1 for every person in Oregon with MS and they came close; raising nearly $6,000. This puts the club in 10th place in Oregon in the "Friends and Families" team division and 11th place overall. Great Job!!! 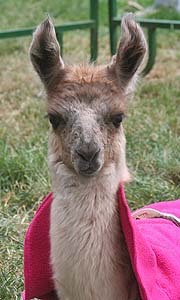 Julie and I want to send special thanks to both the club parents and the llama community. To the parents, we appreciate your help with the fundraising and provided extra hands during the walk in April! To the llama community, thank you for your generous donations to this cause - a large part of the club's success is due to your contributions. We really appreciate your participation. Well, we had black ice followed by packed snow on the roads on the first day of our trip to the 2005 National Show, and coming home they closed I-80 west of Cheyenne and that night we had temperatures in the teens with blowing snow driven by 30 mile/hour winds, but WOW, are we GLAD we were there - what a final day we had at the 2005 Grand National Show! We ended up with two of our girls in the front row of the Heavy Wool Championship class and Gold Sparkle was named the Grand Champion Heavy Wool Female! Then Fino Chilean Rosario (in the picture to the left) was the class champion for the Heavy Wool Two Year Old Males. And to top it all off, Gold Glitter’s Produce ended up with the blue ribbon (Gold Glitter is Gold Sparkle’s dam) and Bolivian Asombroso’s Get also earned the top honor. You can see a summary of the 2005 show results here. Please take a look through our site, and then make an appointment to come visit us and let our herd show you why llamas are so special.